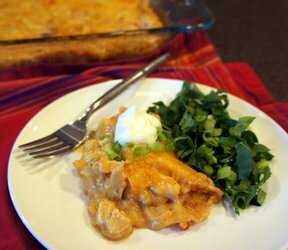 Use up some of your tortilla chips instead of using tortillas for this quick enchilada casserole. Perfect beside a little lettuce with sour cream and green onions. Preheat oven to 350 degrees F. Spray a 9x13 inch glass casserole dish with cooking spray. Cook chicken in water until done, then chop or cube it. 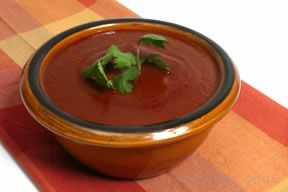 In a saucepan, heat soups, tomatoes with chilies and evaporated milk. Add cooked chicken to soup mixture. 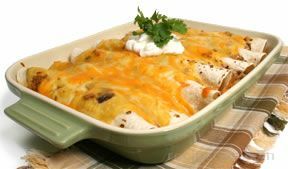 Make layers in prepared pan, starting with tortilla chips then add chicken mixture on top, then add cheese. Repeat. Top with sour cream and onions if desired. "My family loved this. I used hot enchilada sauce so it was a bit spicy, but perfect with the lettuce and sour cream to cool it down. I also didn't have evaporated milk so I used skim and it tasted great. Easier than rolling up each one individually, probably not as pretty, though."